while working on own GPS diciplined oscillator (GPSDO) project i needed few references so bought multiple of TruePosition GPSDO board form True Position LMU300 receiver unit. 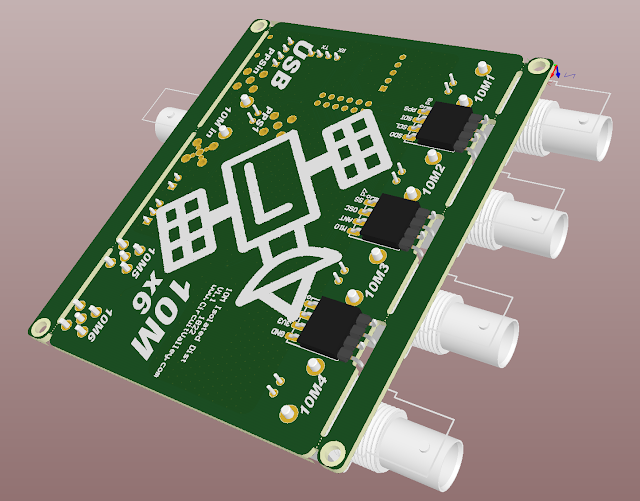 These Trueposition GPSDO are relly nice boards but they as usual only one single output, so made my self This little Distribution board to have up to 6 Isolated 10 Mhz sine wave output. 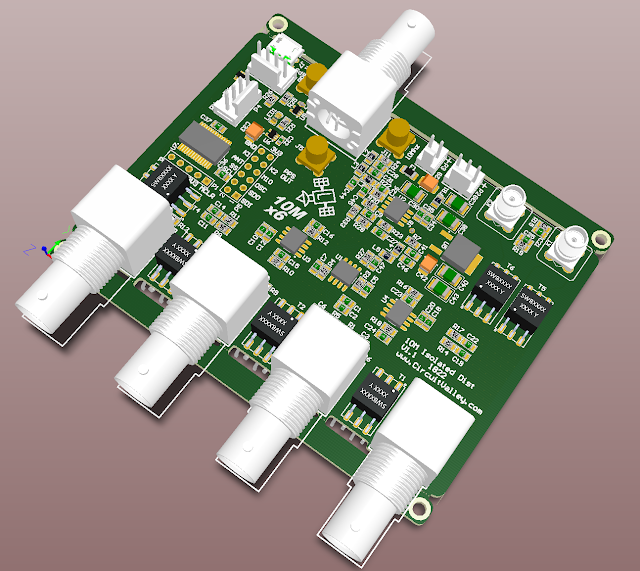 There is not many things in hardware but few LC filter to clean 10Mhz sine wave and few powerful opamp with isolation transformers to drive multiple 50Ohm load. 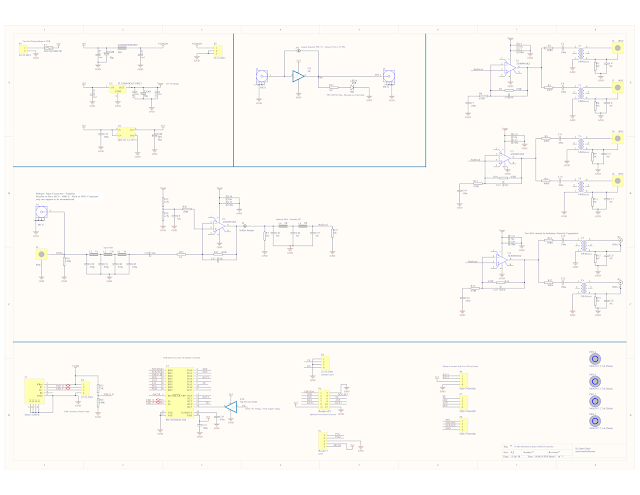 In the signal path schematic consist of LC filter Low pass filter cutoff frequency of filter is not exactly 10Mhz but some where around 10.8Mhz , because these filters are quite sensitive to even a little value change of component and getting exact 253.67 pf capacitor or 1299.605 nH inductor is either hard or really expensive so i chose inductor and capacitor value to be close enough commercially available values. Inductor and capacitor with good precision and descent temperature stability. 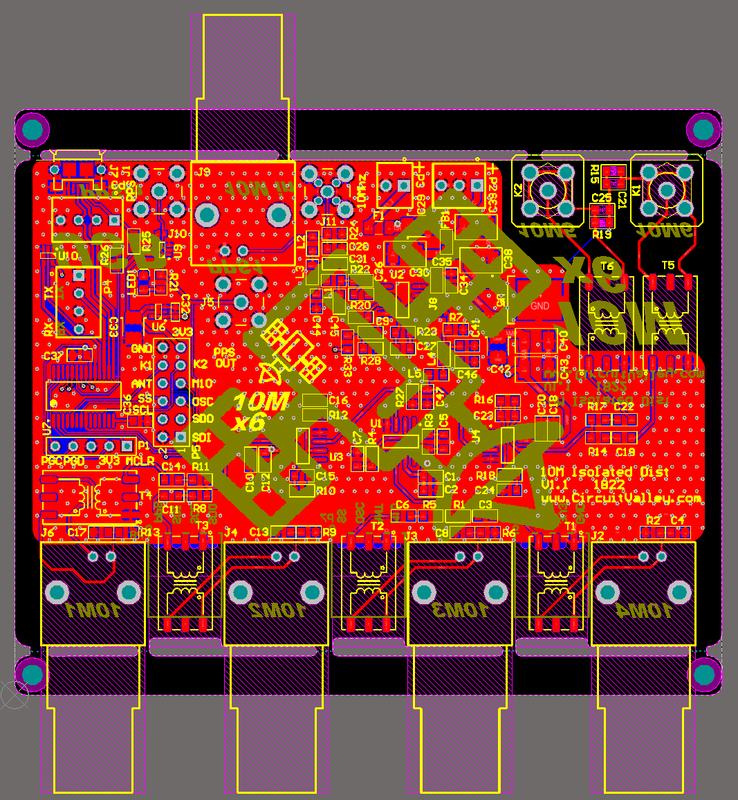 All the component used in this board are directly sourced either from manufacturer or standard sellers like mouser , digikey or arrow. None of the components were bought from ebay and expected to work keeping fingers cross. 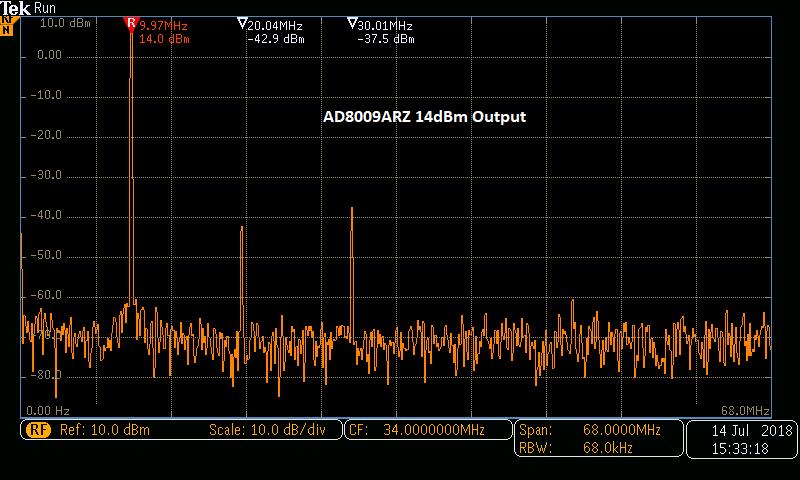 After filter these a preamp AD8009ARZ , and then one AD8009ARZ per two channel because one AD8009ARZ capable of delivering 175mA so one opamp AD8009ARZ can easily drive two isolation Transformers. Isolation Transformers i am using here are RF isolation transformer from Coilcraft These transfomer are from SWBxxxx series ,and capable of delivering upto 250mA and maximum frequency upto 100 Mhz or 175 Mhz with seaming flat response throughout whole frequency range for 100Mhz. 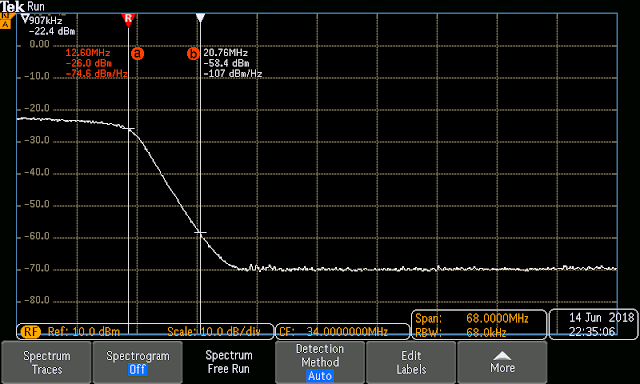 i have set opamp gain and everything else to achieve 10dBm output level into 50Ohm load (+/-2dBm). I have made this board first with LM7171 opamp but output level of 10dBm was hard to achieve as this circuit is powered from a single 12V rail , and LM7171 output swing is already quite small, output swing gets even smaller when load increase. 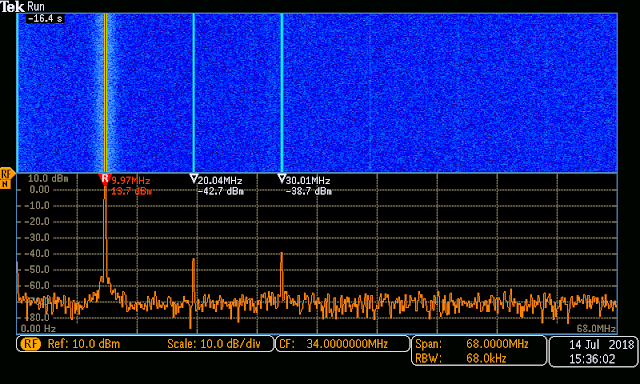 which causes distortions in the signal. 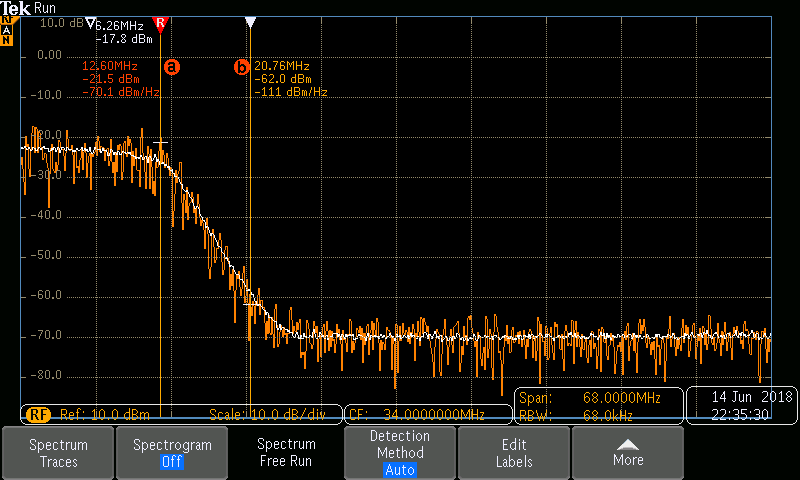 i have looked at distribution board made by other people but no one say much about signal quality and full load so i decided to do a little work and after searching and trying different opamp for quite some time. 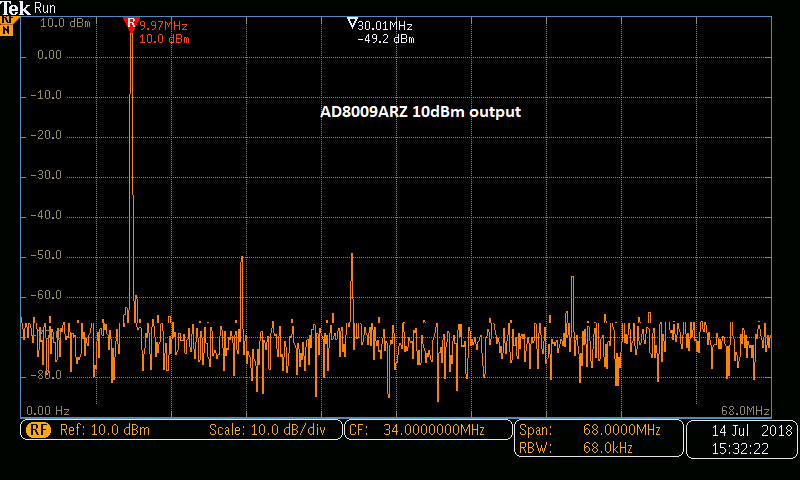 I moved away from LM7171 and decided to go for AD8009ARZ which has really large output swing even with descent load. 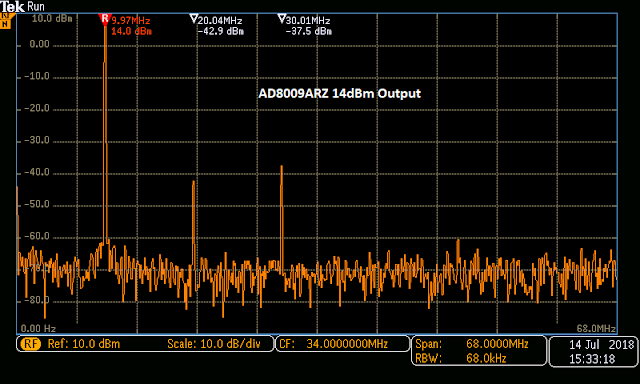 with AD8009ARZ i have made few test, with both of the channels loaded with 50Ohm output level can be easily up to 14 to 15dBm. 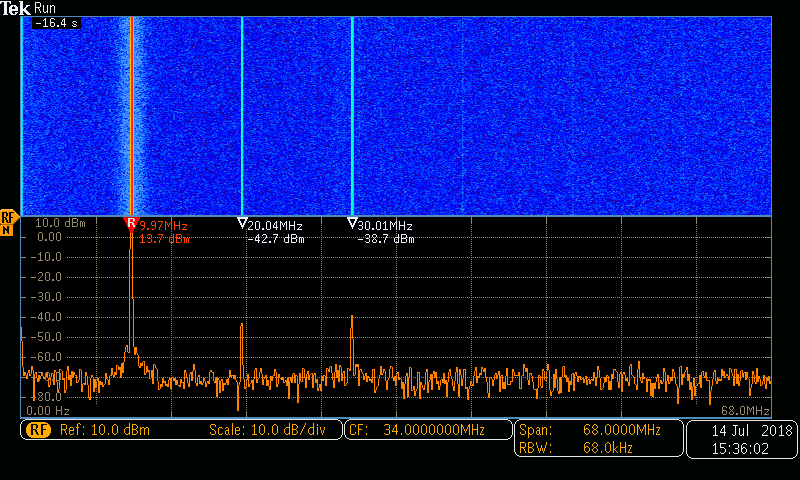 second harmonic is ~57 db down which is really good signal . 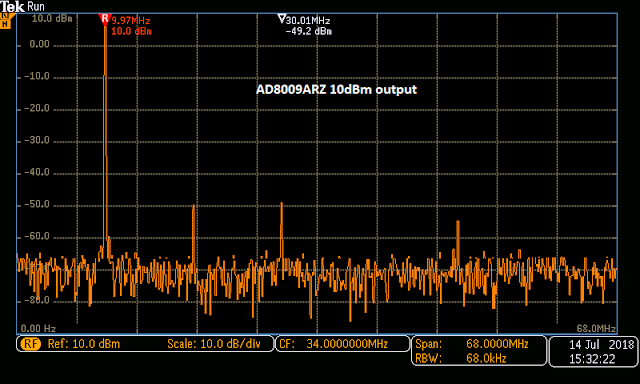 AD8009ARZ 10dBm Swing. 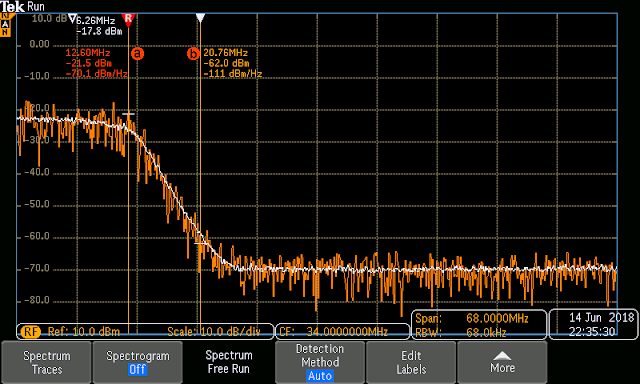 second harmonic is about 60dB down compare to 10Mhz signal. Here the view of test of the passive Filter , i am feeding noise with bandwidth of 120Mhz using my Arb gen.
As this board is suppose to be used with GPSDO so these i a USB capable microcontroller on board which control User interface, Display relevant info on oled display and act as USB to Serial converter so that GPSDO can be connected to PC without any extra hardware. 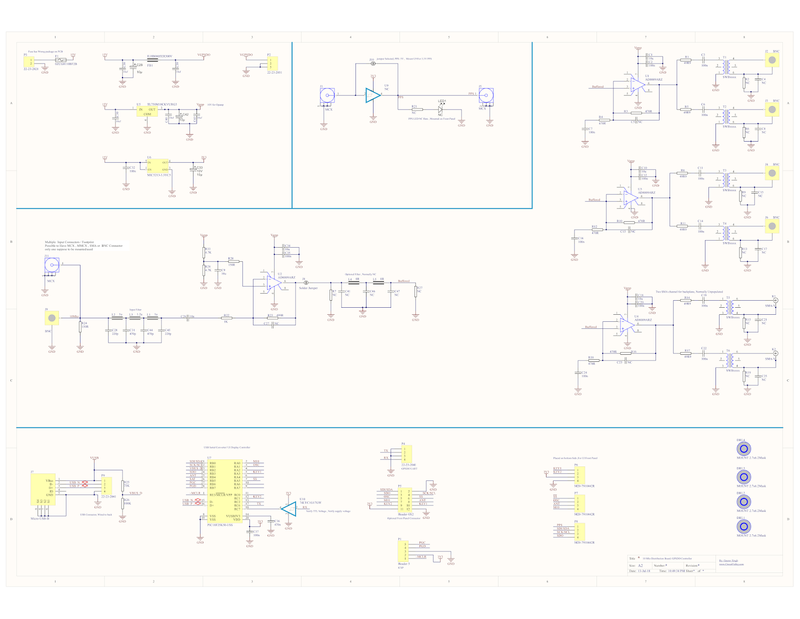 Source of the Microcontroller also available in my gitub repo. 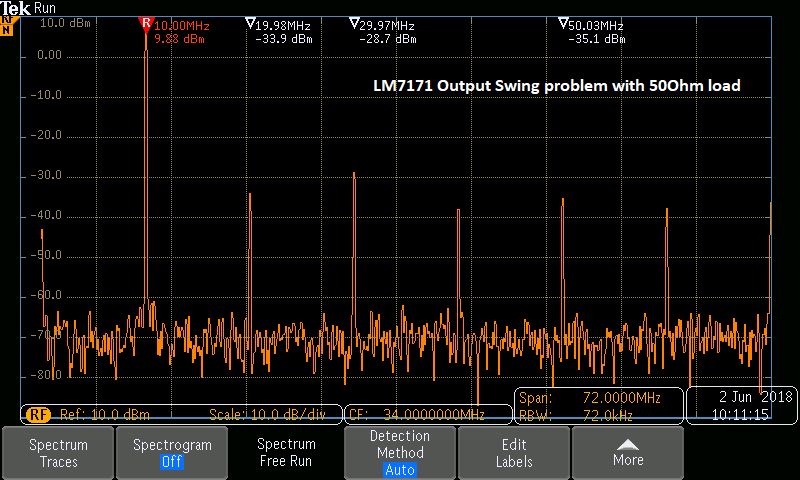 Firmware / microcontroller has no role or control over distribution section. PCB Layout source are available in github repo of this project. Price is set on the based of BOM cost and time and effort to put it all togather.